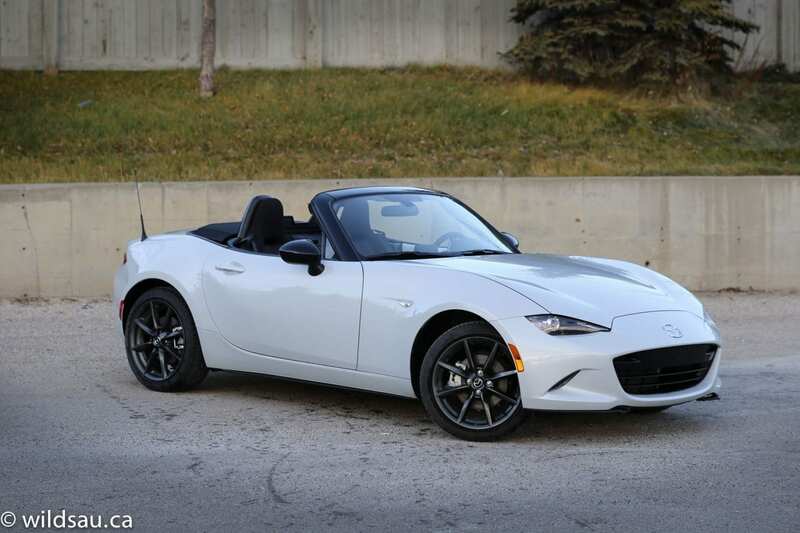 The MX-5 (or Miata) has always been a lightweight roadster that puts priority on its incredibly involving driving dynamics. 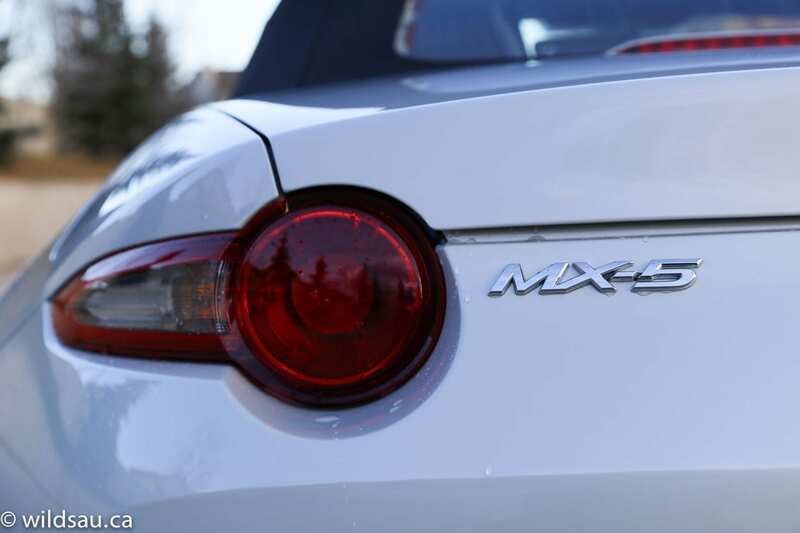 I put the all-new 2016 MX-5 through its paces to see if it stays true to its roots. In terms of dimensions, the new MX-5 is, contrary to nearly any other car model out there, smaller than the last generation. It’s actually quite close to the original, and that is a refreshing change from the industry norm of bigger, bigger, bigger. The new ragtop’s styling is instantly recognizable, but is also vastly changed. 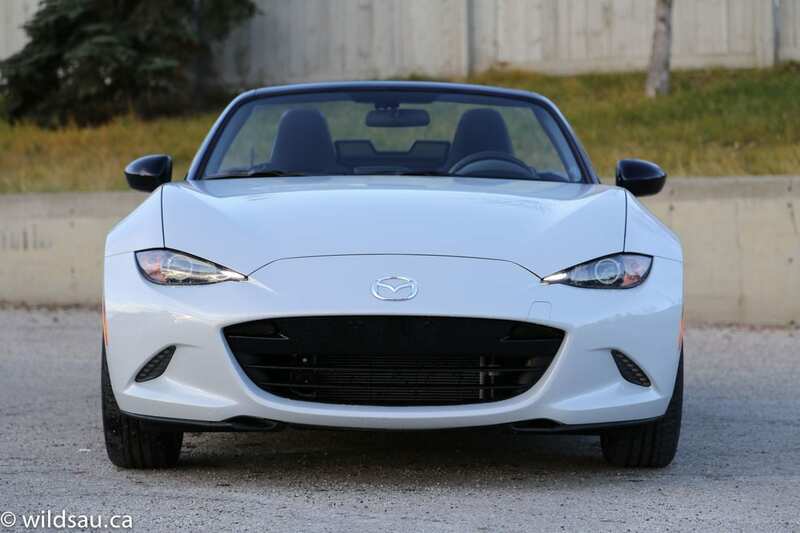 It is a new approach, one that results in a car that looks more substantial than any previous MX-5. I was surprised at how many onlookers didn’t approve, but the cast majority loved it. 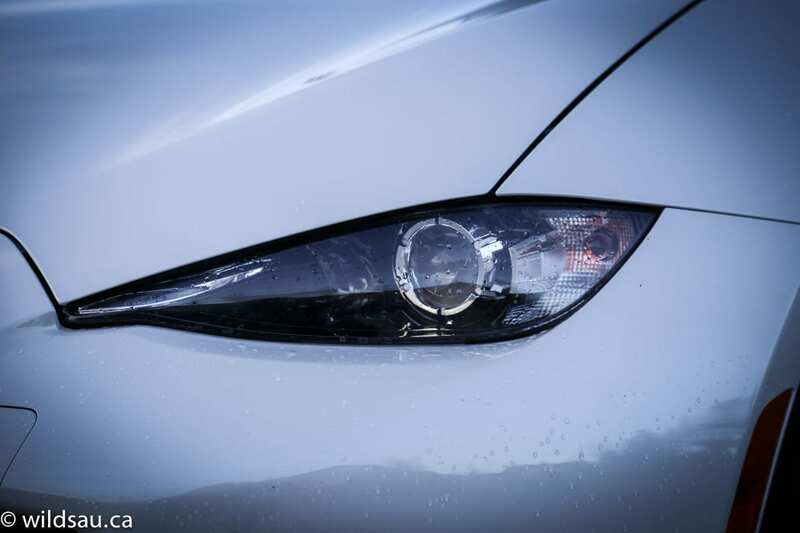 Up front, modern LED headlights and daytime running lights adorn the front end, which looks a bit fish-like, and out back LED tail lights complete the package. 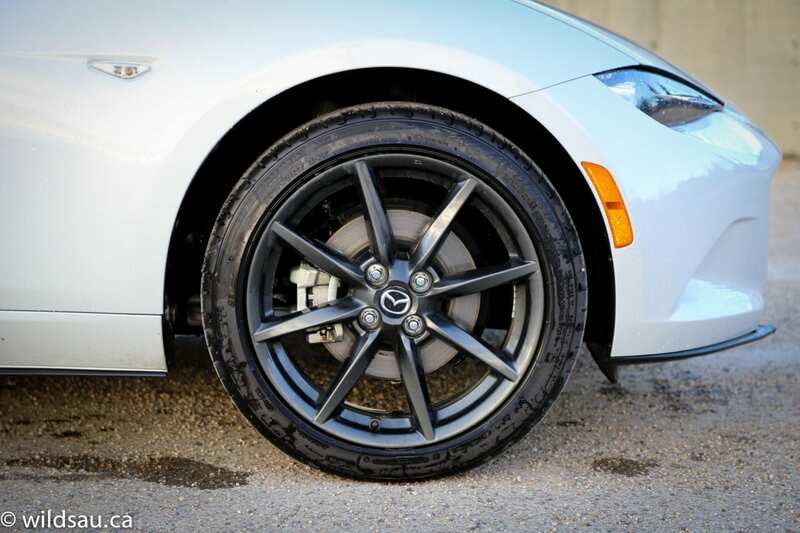 The 17-inch rims get big-enough 205/45-sized rubber. It’s an intimate cabin but it feels more roomy than past MX-5s. I’m 5’10” and I had about 3 inches of head room with the top up, so that’s quite good actually, although this isn’t a spacious cockpit by any stretch of the imagination. I had a couple of nitpicks once I got comfortable. I didn’t find the instrumentation that great. Although the big tach is a delight, the speedometer is hard to read – I found it difficult to quickly tell what speed I was going. 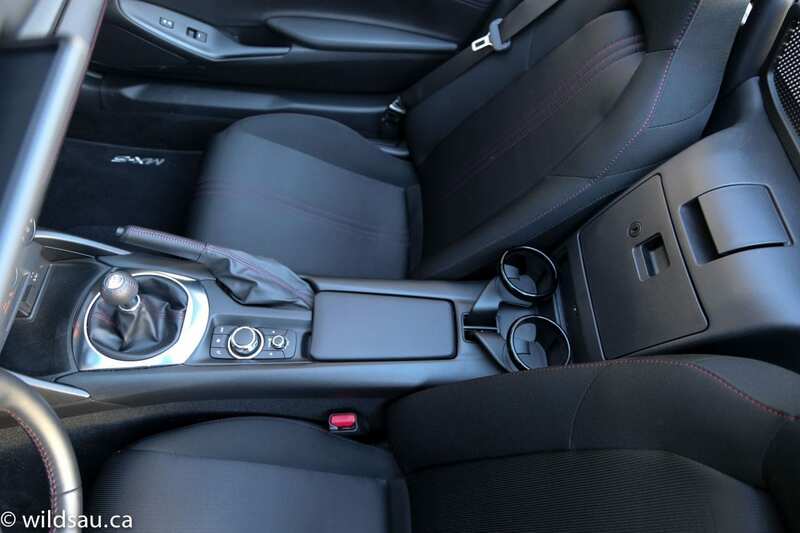 The materials in the very basic feeling interior seem a bit entry-level for a nearly $40,000 vehicle, with hard plastics to be found everywhere except on the door panels and on the tiny armrest lid. But you know, none of those things end up mattering much when you start driving. Because the things that do matter are done properly. The manually adjustable seats (in black fabric with red contrasting stitching) are comfortable and very well bolstered. I’m stocky but not huge, and my shoulders are about as wide as you’ll want to go with them – anyone broader than me will find them uncomfortably restrictive. At this price, I also found it a bit off-putting that the seats are not heated. 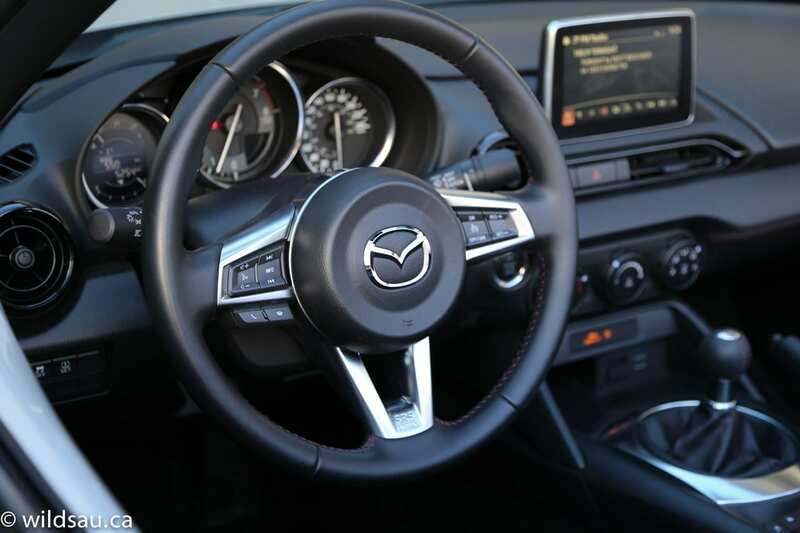 The leather-wrapped steering wheel and shift knob feel perfect in hand. 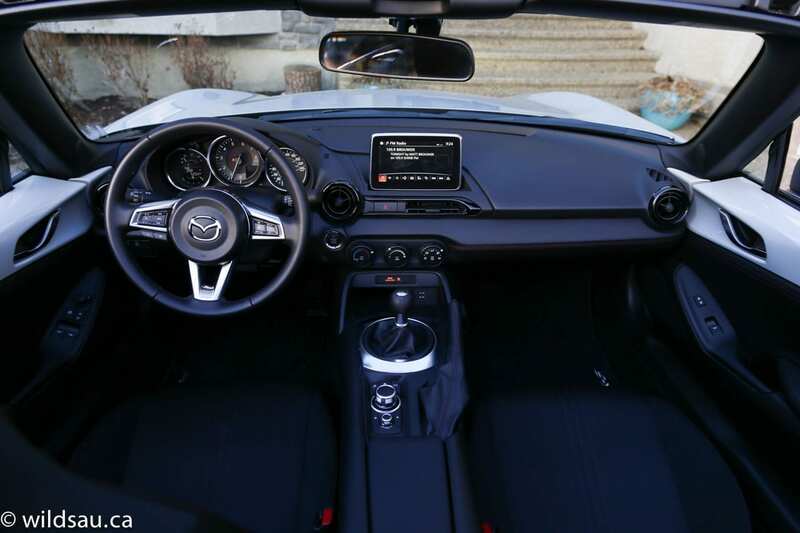 There’s a 7-inch touchscreen floating above the dash, and you can also control the system with Mazda’s rotary HMI Commander knob on the console. It handles your phone, the tunes and navigation and it all works pretty intuitively. 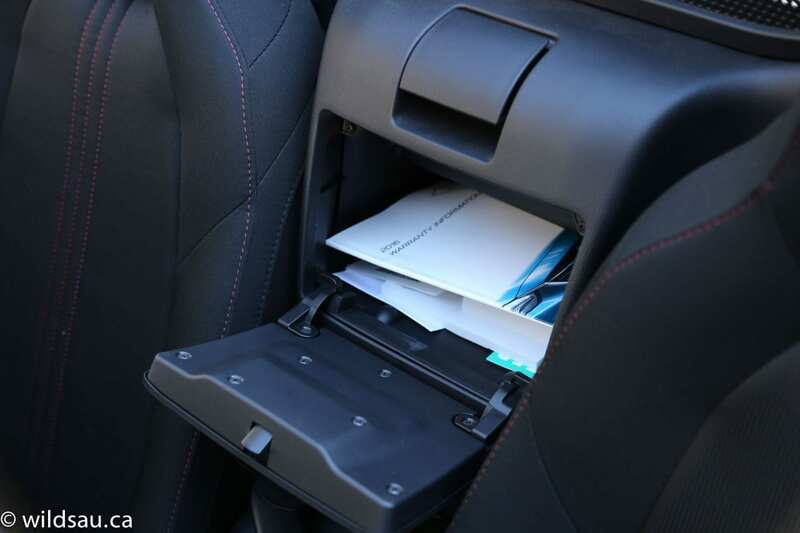 Storage is hilariously limited to a small drop-in bin at the front of the centre console and a forward-facing lockable glove compartment between the seats. 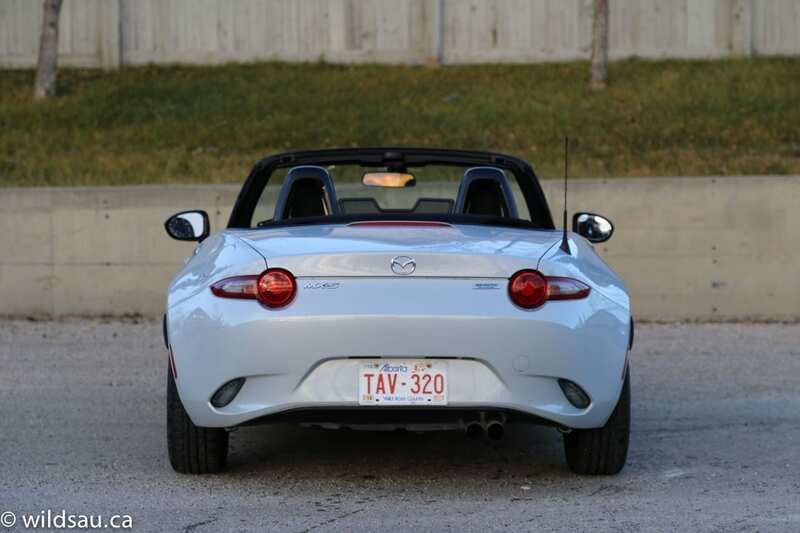 The cupholders are a statement and I’m pretty sure the statement is “You don’t need to be drinking anything while you’re driving your MX-5!” They are centrally mounted, behind your elbow(s). Again, things like storage and cupholders shouldn’t matter much when you’re shopping for cars like this. 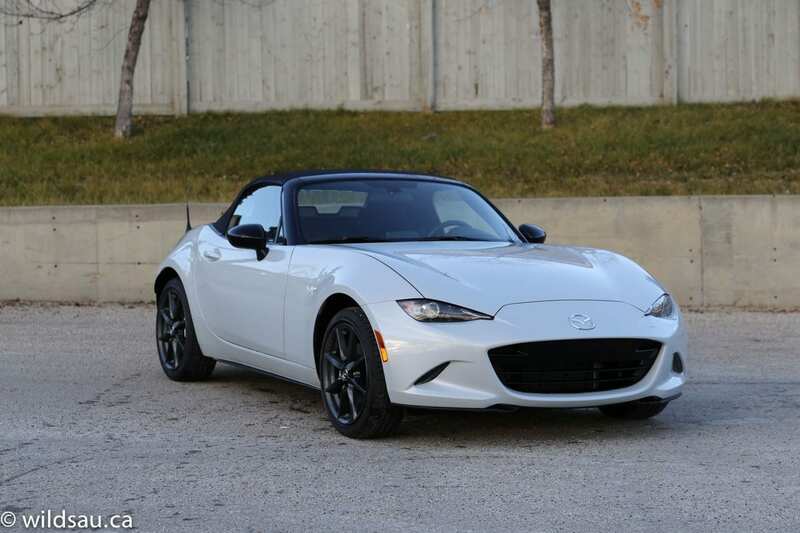 Here is one of the new MX-5’s biggest surprises. 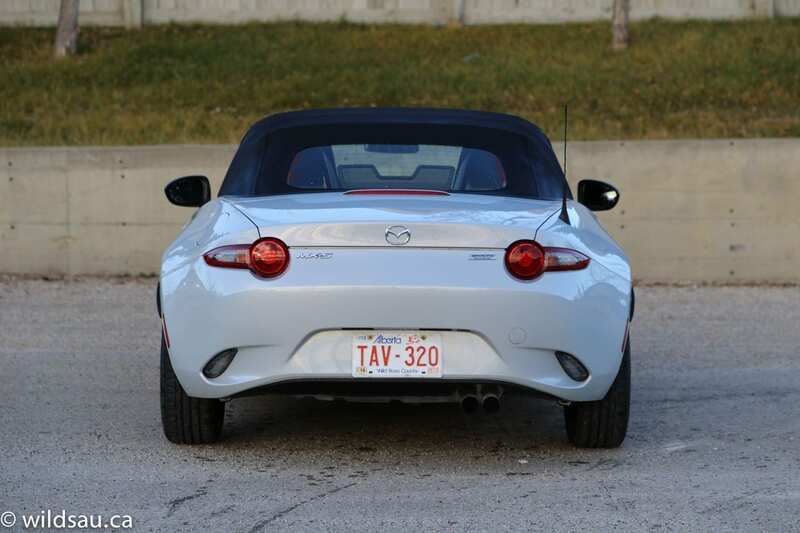 Mazda’s 2.0-litre Skyactiv 4-cylinder is the motivation and offers up less power than the last generation Miata. What on earth were they thinking, cried many an armchair critic when this was announced. The mill puts out a meager-on-paper 155 HP and 148 lb.ft of torque, feeding it to the rear wheels through a 6-speed manual. 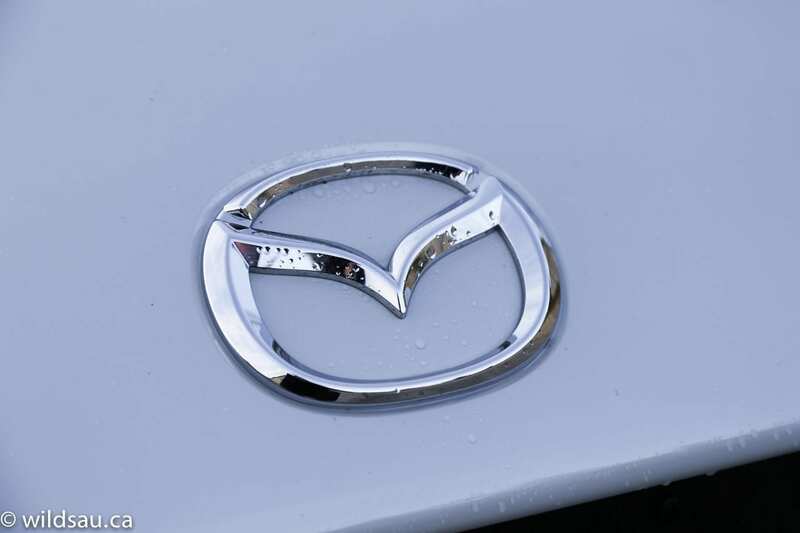 Fuel economy is decent – Mazda says it will achieve 8.8 L/100 km (27 US mpg) in town and 6.9 L/100 km (34 US mpg) on the highway. I averaged a very respectable 7.8 L/100 km (30 US mpg) during my week with it – respectable because it was mostly city driving and much of it done with a lead foot. The MX-5 requires premium fuel. This is where the magic happens. 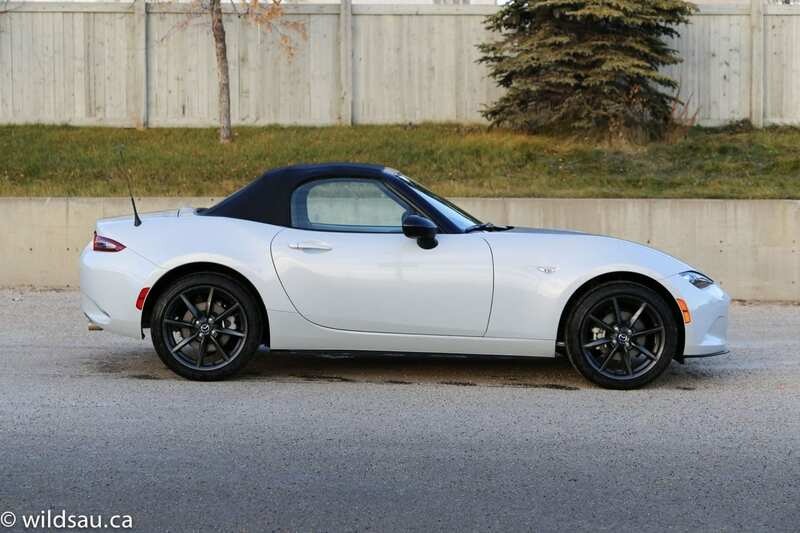 This is why people bought the Miata and the MX-5. This is its whole purpose. The MX-5 was born to boil down the experience of driving to its purest, simplest and most enjoyable basics. And as it always has in the past, the MX-5 continues to succeed in this area. In a big way. 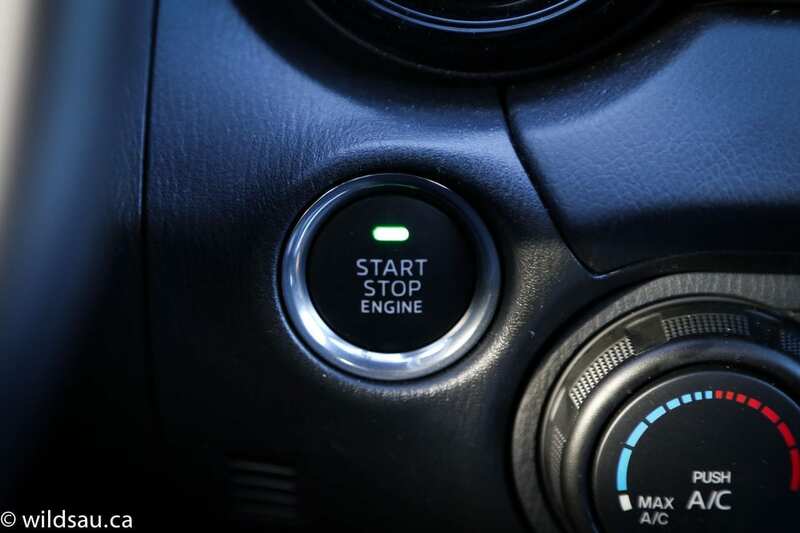 It starts when you depress the push-start ignition and the little roadster barks to life. 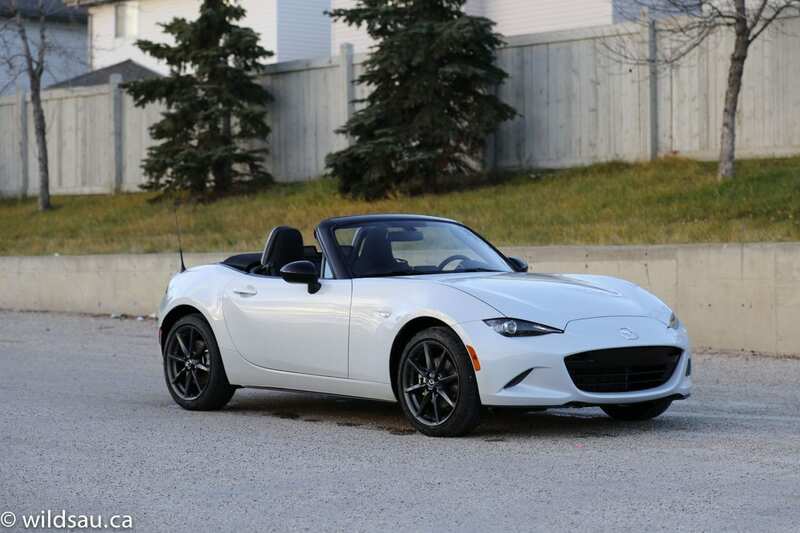 Mazda gives the MX-5 a great clutch with light enough action and an easy take-up, making it as easy to commute with as it is to take to the track. 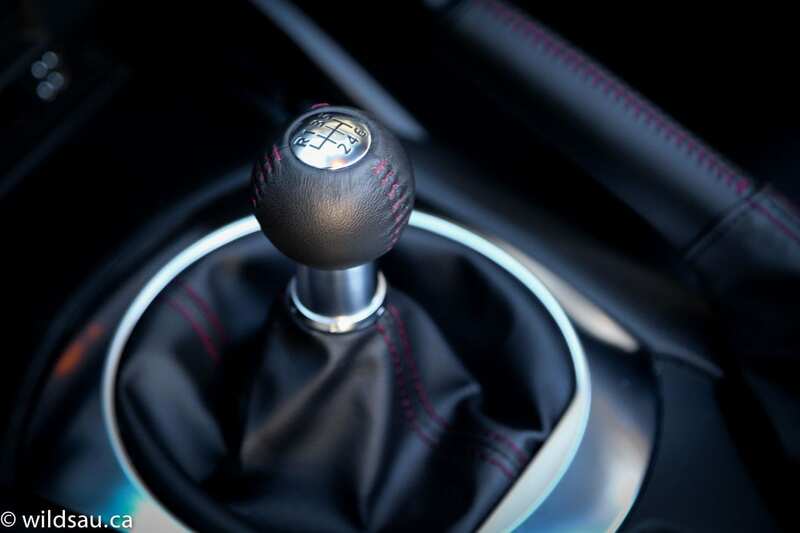 The shifter’s throws are short and mechanical – there’s enough notchiness that you know exactly when you’ve shifted, every time. It’s not sloppy but it’s still plenty smooth. 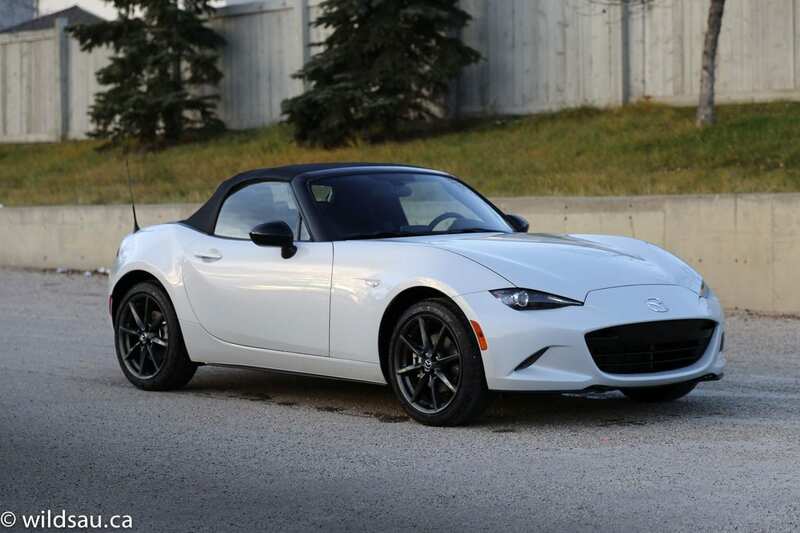 The engine has enough power to surprise you and makes the almost feather-weight 2332 lb (1058 kg) MX-5 feel plenty responsive. 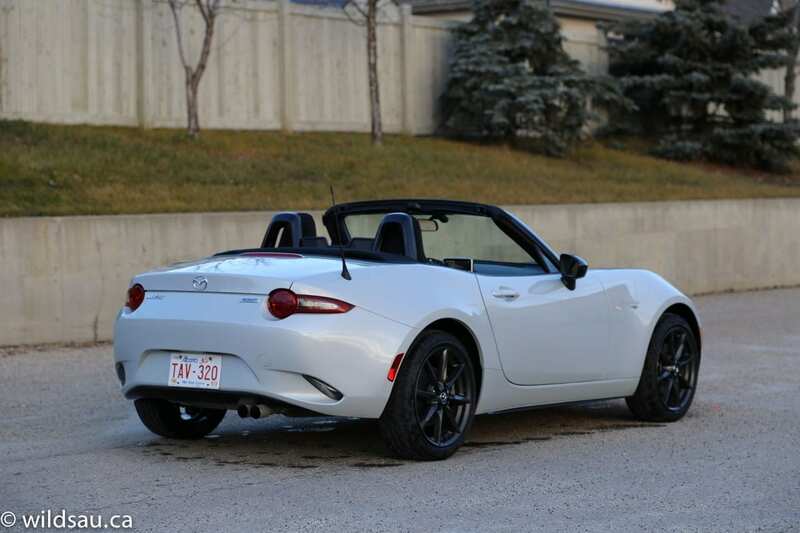 It’s not the fastest car in a straight line, but it is the quickest Miata yet and let’s be honest – 0-100 km/h in 5.9 seconds isn’t slow by any standards. Of course, the dragstrip is never where the MX-5 was happy. Its eminently tossable handling – thanks to the nearly-flawless electronic steering, a limited-slip differential, immediate and crisp turn-in and what feel like inexhaustible limits – is what defines this car. Even when you’re playing hard, it brings outstanding stability, balance and control to the table, and you always feel connected to the road. Yes, the suspension is very firm and a bit noisy, but it remains comfortable enough to be a great daily driver. Visibility out of the car (with the top up) is reasonable, although shoulder checking is an exercise in futility. Of course any visibility issues are quickly solved by stowing the black cloth soft-top. And how do we do that? It is another exercise – this time in simplicity and ingenuity. And it makes nearly every other convertible seem clumsy and overly complicated in comparison. You unsnap the top at the header and fold it back behind your head. 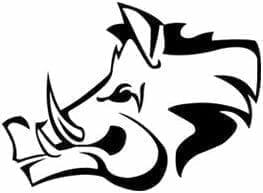 No heavy power mechanisms to slow you down, or to break down. It’s all done manually and it takes about 2 seconds and you do it while you’re sitting in the driver’s seat. 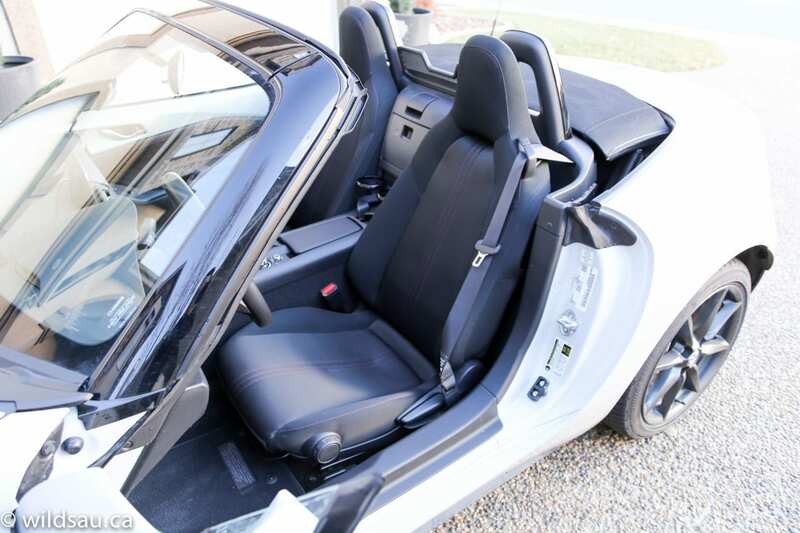 When it comes time to put the top back up, you unsnap it (there’s a latch between the two seats) and a spring-loaded assist launches it forward slightly, making it another 2 second job to push it forward and lock it into place again. Delightfully simply and effective. No more and no less than necessary. The top has a glass window but is not very well insulated. Frankly, it’s downright noisy in the MX-5. At all speeds. 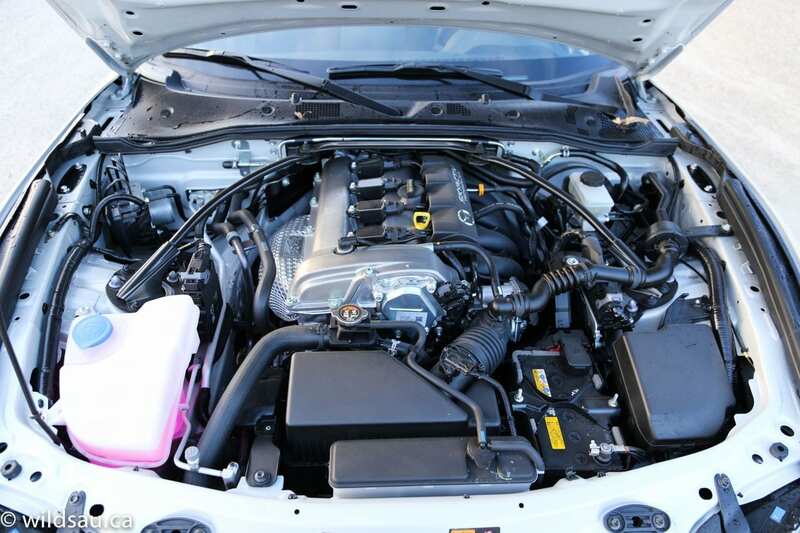 There’s some engine noise too, a bit of a tinny snarl that you’ll recognize if you know Mazda’s Skyactiv engines. It’s not the greatest sounding 4-cylinder around, but I like that Mazda didn’t shy away from letting it speak. 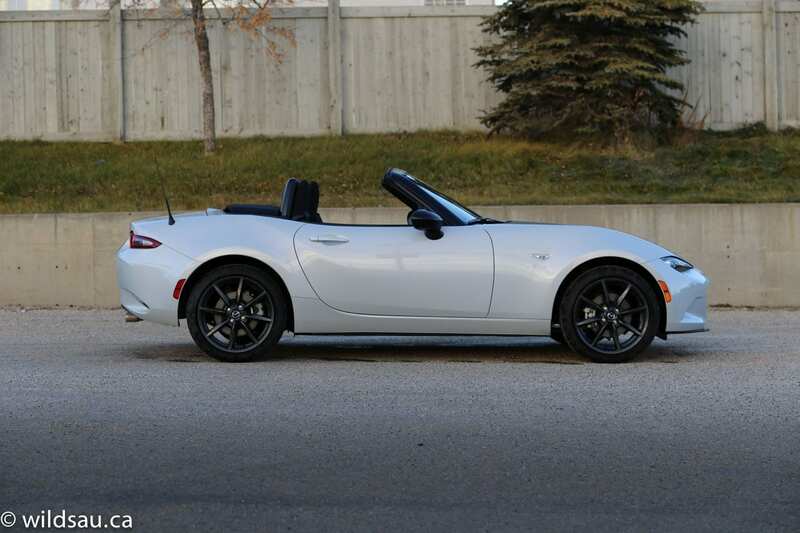 The MX-5 is just so much fun to drive. 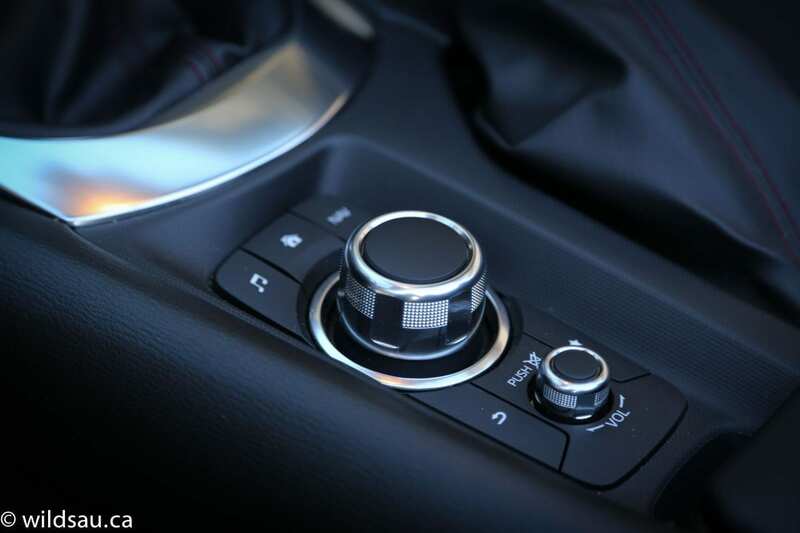 As I noted, the car always feels completely connected to the road, and offers tons of feedback through the steering wheel, the shifter and the pedals. It is the consummate driver’s car. 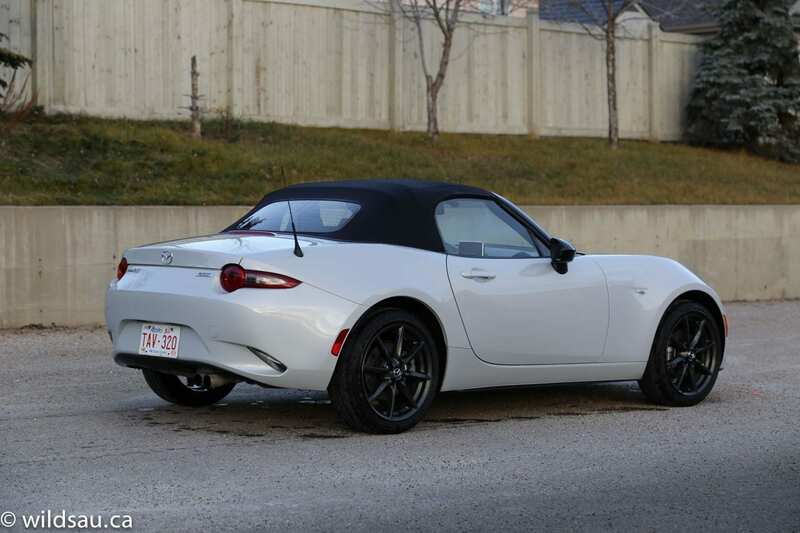 The 2016 MX-5 has definitely preserved its roots but has evolved in wonderful ways. To make a car smaller and lighter than before is the way it should be. Mazda has engineered a light, lean, responsive and lively machine, that precisely does what it promises – and that is to make driving fun. WAF (Wife Acceptance Factor) can only be measured from the passenger perspective as she doesn’t drive manuals. 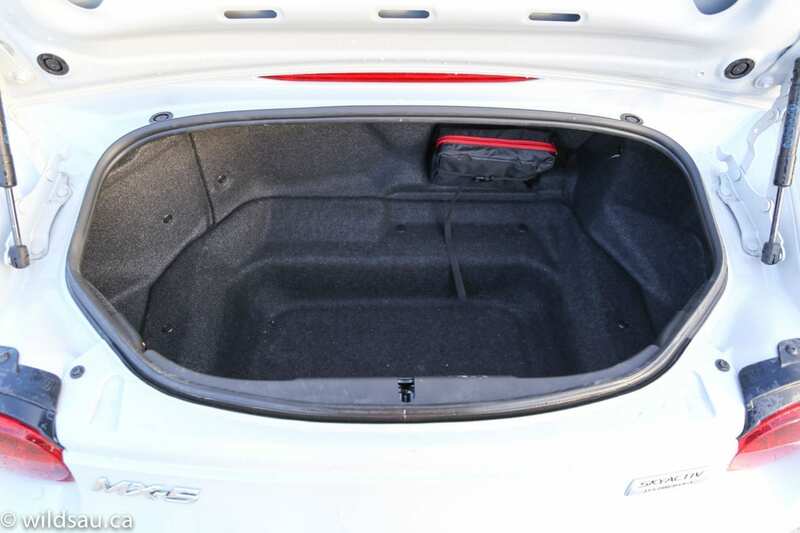 She thought it was too tight, too noisy, the ride was too rough and the trunk was too small. I don’t think my wife was their target demographic. I, on the other hand. am. I want one.